With much of the Livingston High School track and field team remaining behind in Livingston to prepare for the upcoming State Relays, the Livingston long jumpers and many of the team’s newer athletes traveled into New York City to compete at the New Balance Track and Field Center at the Armory. The venue is considered by many in the sport as having the fastest indoor surface in the world. 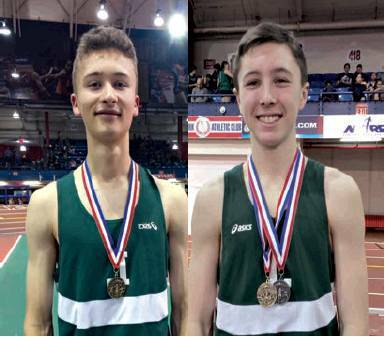 The center played host to hundreds of New Jersey high school runners and jumpers who were there to compete in freshman, novice, and varsity events hosted by the Bergen County Track Club. The night’s best overall Lancer performance came from freshman Quin Devlin, who competed in three events in his age class. First up for the talented sprinter and jumper was the 55-meter dash. Devlin ran a quick first heat and was tagged to run in a semi-final, in which he finished with a time of 7.7.